Cosy, child friendly property with a surrounding balcony. Property 5: Cosy, child friendly property with a surrounding balcony. Property 6: Large, spacious property with private entrance and much privacy. Property 33: Deluxe property, near the woods, lovely garden. 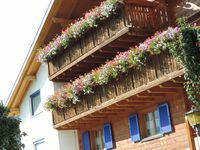 Property 38: Family friendly wooden house for 4-5 persons in the Montafon! Perfect ski holidays! A modern, cozy family apartment with two bedrooms, 68 kvm. Property 39: A modern, cozy family apartment with two bedrooms, 68 kvm. Apartment in top location - for 1 to 5 people! Property 45: Apartment in top location - for 1 to 5 people! Nice cozy apartment with panoramic views of the Magnificent Mountains. Property 46: Nice cozy apartment with panoramic views of the Magnificent Mountains. Property 48: Modern, well cared for vacation address. We stayed in this apartment during 1 week in July 2018 and enjoyed it a lot. It is spacious apartment, very well equipped kitchen and useful separate living room area on top of 2 bedrooms and kitchen area. Also possibility to sit outside in sun/shadow at all times. The owners are very friendly and helpful and there are lots of activities to be done in the area. All in all we had a great time!! The only watchout is that ceilings are at 2M height, so not too convenient if you are &gt;1.90m.